Looks and feels better than last year's version, plus we don't have to waste time on Planechase. Sealed falls short of being a true juggernaut, leaving you wishing you were drafting at Friday Night Magic instead. A year ago this time, I was barely scratching the surface on the multi-planed world of Magic The Gathering – otherwise affectionately abbreviated as MTG. But getting addicted to this game isn’t really all that difficult when you’re catching up on roughly two decades of cards and gameplay. The cool thing about MTG though is that while the game is still very healthy in a physical card-slinging state, the digital version of the game is seeing quite a bit of life as well – evidenced not only by the fact that Magic Online is alive and well, but that the console/application version of the game Duels of the Planeswalkers is in full-force a couple weeks prior to the launch of the game’s 2014 core set. 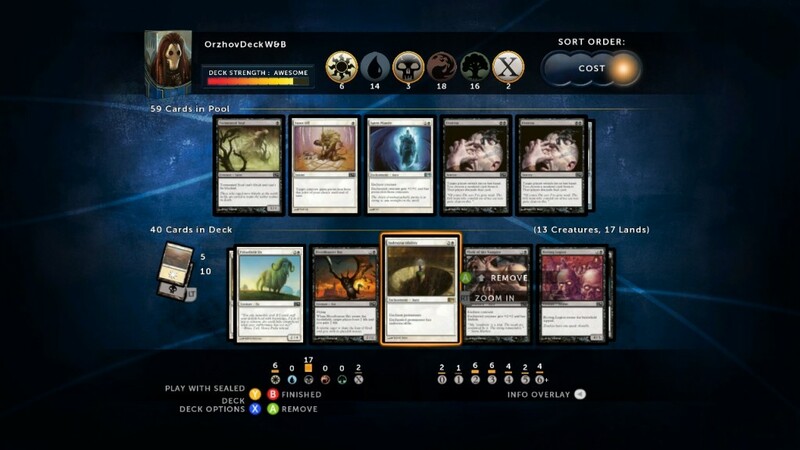 It doesn’t take much time to see what has and hasn’t changed in DotP though, as the 2014 version makes some nice tweaks and stays on the course on the core of the gameplay to continue a strong presence in Magic’s digital form. Even if you’re a bit unseasoned in the years of Magic that have come and gone, DotP takes at least recent history into account when crafting a solid, engaging campaign mode. Where 2013’s version felt a bit slapped together until you ran into Nicol Bolas, the path of this iteration is ripe with story and tiny bits of information to set up your towards the end of each section – whether it be Zendikar, Innistrad or Ravnica to name a few. In this sense, we can feel a bit more in tune with the overall feel of the world we’re playing in as opposed to just playing a card game that has some names and abilities attached to it. Visually, the game adds some nice touches – visually moving cards, less repetitive graphic wisps, brighter hues in the overall look of the game – and a revamped battlefield to boot, making 2014 a hugely aesthetic improvement over the darker slates of 2013. For the gameplay itself, the tutorial levels do a great job of getting you primed for what can be a pretty, er, interesting variety of enemies. Everything from zombie decks to pseudo ‘White Weenie’ to Jund to well, Eldrazi madness. It definitely makes the startoff of the game a bit challenging but fun when you can’t really prepare to your utmost when starting off. With the way the metagame of MTG has gone lately, it really makes for a great front-to-back run of things when you have to prepare for a number of game plans with your pre-made decks. Sure, some decks work better than others, but it takes time to really hone these decks with unlocked cards and proper play time. On the flip, the seemingly popular sealed option replaces Planechase – thank goodness – making for some interesting draft moments that aren’t completely like drafts. Instead of picking and passing, you get a cluster of packs all to yourself. It’s a catch-22 though, as the pool of cards challenges you to be creative with your crafting with a forty card deck, but the ability to truly brew like a draft is hindered by having to take a huge handful of possibly dead cards. It’s a gameplay option that isn’t as accessible as the regular campaign, but it’s worth a gander for those looking for a bigger challenge. Add in the challenges, which present a reasonable amount of challenges both enjoyable and mind-racking, and you get a game that capitalizes on what it does best without making the game unplayable for the rookie or the veteran in the process. Whether you know nothing about Magic or you’re a seasoned veteran of the battlefield, Magic’s newest DotP has something for you to enjoy. It isn’t quite on par with the hopes of being able to full customize your decks a la Magic Online, but for a measly ten bones on Xbox Live and a chance at a promo pack of cards, why wouldn’t you at least give it a chance? At worst, it’ll do a fine job at helping hone your skills, as well as being a huge vacuum for time in the process.